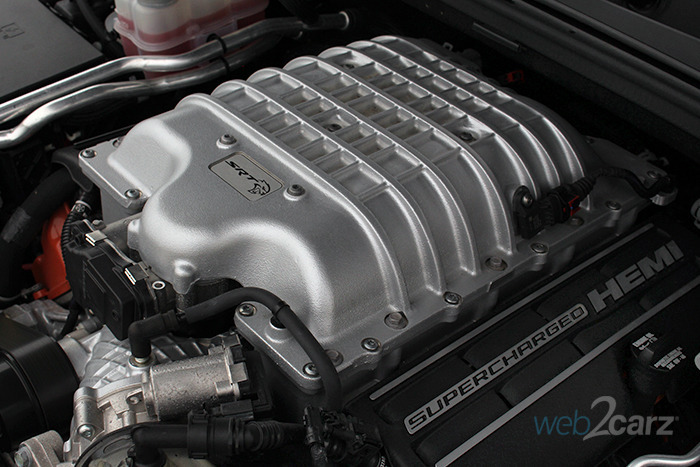 The 707 hp 6.2-liter supercharged V8 is the biggest attention grabber for this vehicle. The neck-snapping acceleration, deep throaty exhaust, and whine of the supercharger is intoxicating. Despite its performance capabilities, the Trackhawk is still easy to drive slowly when needed. It can be a legitimate daily driver and tow up to 7,200 lbs. Ride Quality: The suspension is on the firmer side, but it's not horribly jarring. You do bounce around a little bit over the bigger bumps and gaps in the road. Acceleration: Startlingly fast. Jeep claims a 3.5-second 0-60 mph time. It doesn't matter if you're at a stop or cruising along at 60 mph, if you put your foot down, you're going to rocket away like the Millennium Falcon escaping the Empire's battleships. 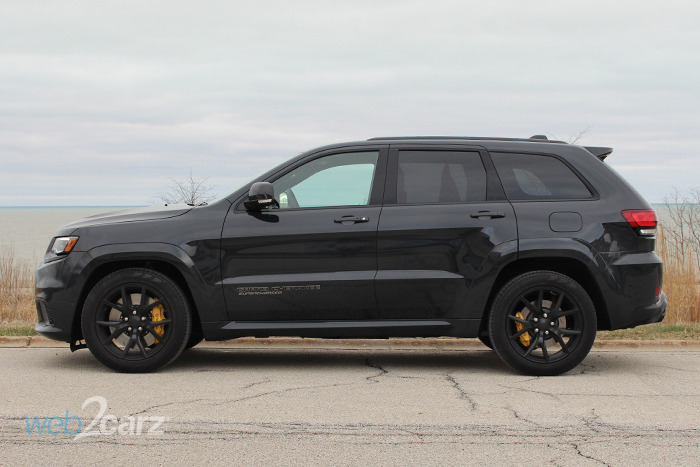 Braking: The massive, yellow Brembo performance brakes haul the Grand Cherokee's mass to a stop very quickly. The brake pedal is progressive, too. Steering: Well-weighted and precise. You can put this high-performance machine right where you want it. Handling: You're still dealing with physics and can't toss this heavy vehicle around like you can a Miata, but the Trackhawk handles twisties with control and little body roll. 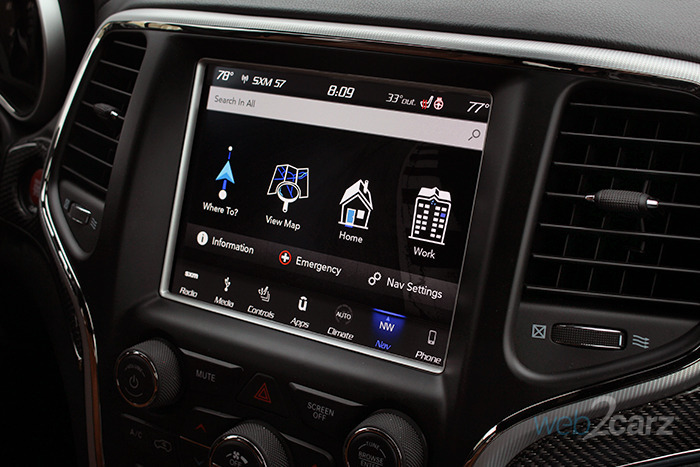 FCA's Uconnect infotainment system is one of the better out there. The system features plenty of applications and is easy to use. Other automakers could learn a few things from FCA's system. Infotainment System: The 8.4-inch Uconnect system is smooth, fast, and intuitive. It has numerous features, including Apple CarPlay, Android Auto, and built-in navigation. The screen is plenty big enough, and the graphics are crisp and clear. Controls: The touchscreen is the main means of controlling the system but there are a few buttons and knobs that help you navigate and adjust settings. They all work well and are smartly placed. The Jeep Grand Cherokee Trackhawk still looks like a Grand Cherokee, but it's a lot more menacing. Jeep punched up the styling with plenty of sporty elements. It's noticeable but not over-the-top, which is something we really like. 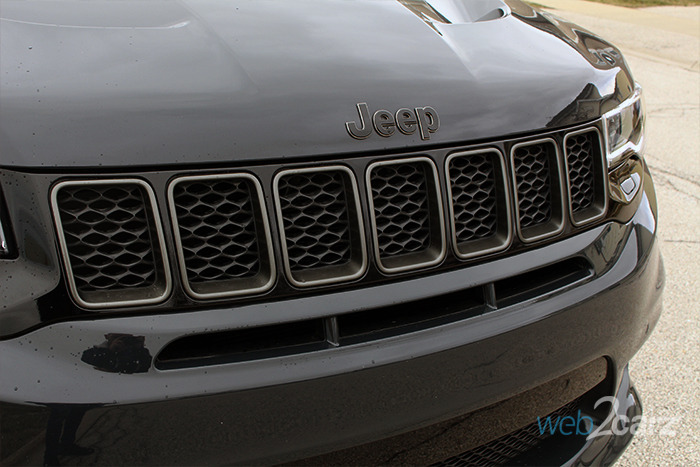 Front: The front features a special seven-slotted grille, low air intakes, and LED lights. It's a menacing mug that does more than hint at the Trackhawk's capabilities. Rear: The rear is a little more typical for the Grand Cherokee and less dramatic than the front. The quad exhaust and rear diffuser are the big performance giveaways here. 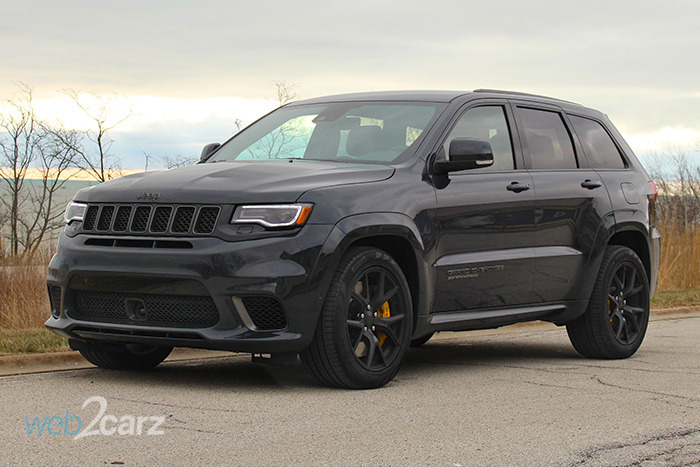 Profile: From the side, the Trackhawk looks excellent, with its large 20-inch wheels and yellow Brembo brake calipers being the two most eye-catching elements. Cabin: Inside, the Grand Cherokee plenty of leather, special 'Trackhawk' steering wheel and a few other unique styling elements. Otherwise, it's a typical Grand Cherokee, which isn't a bad thing. It's an overall attractive interior. The cabin doesn't just look good. It offers up some seriously comfy seats, plenty of room, and good ergonomics. It doesn't stray far from the typical Grand Cherokee's formula and the model is comfortable for short jaunts or longer road trips. Front Seats: The 8-way power-adjustable performance seats are clad in high quality suede Nappa leather. They provide plenty of support and bolstering and plenty of room. 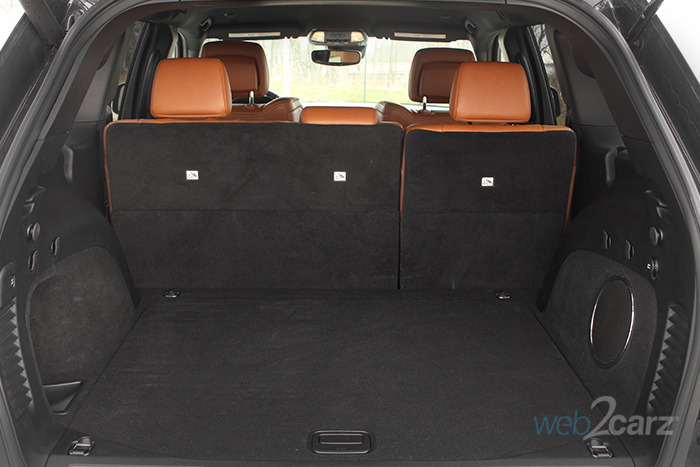 Rear Seats: The rear seats offer plenty of space for the outboard seats. The middle seat is small for an adult. The seats themselves offer plenty of support and the same upholstery as the front seats. NVH (noise/vibration/harshness): The Trackhawk feels solidly built, and we noticed no errant noises. The engine noise is noticeable. It's a sound that most people who buy this vehicle will love. Both exhaust growl and supercharger whine make it into the cabin. Overall, just about any noise you get in the cabin is good noise. Visibility: Seeing out of the Trackhawk is pretty easy. Sightlines are good and the rearview camera and sensors show you want you can't see out the windows. Climate: The automatic climate control works quickly and is powerful. The heated and ventilated front seats and heated rear seats also work well as does the heated steering wheel. The 2018 Jeep Grand Cherokee Trackhawk gets good but not excellent safety ratings and comes with a pretty long list of standard safety equipment. IIHS Rating: The Grand Cherokee received 'good' ratings on all crashworthiness tests except the front and overlap ratings. The driver's side overlap was rated 'marginal' but the passenger side was not yet rated. The headlights were rated 'acceptable', and the child seat anchors received a 'marginal' rating. NHTSA Rating: The Trackhawk trim level was not rated by the NHTSA. The regular Grand Cherokee received a four-star overall rating. Standard Tech: The Trackhawk comes with a lot of great safety tech as standard equipment, including airbags, parallel and perpendicular park assist, LaneSense lane departure warning, full-speed forward collision warning plus advanced brake assist, adaptive cruise control with stop, blind spot detection, ParkView backup camera, and electronic stability control. Optional Tech: There was no optional safety equipment. The Grand Cherokee is a practical SUV. It offers good amounts of storage and cargo space, and the Trackhawk version of the vehicle isn't any less practical than the regular model. Storage Space: There's are two cup holders, a small cubby in front of the shifter for small items, and a space under the armrest for larger items. Cargo Room: The Grand Cherokee Trackhawk has 36.3 cubic feet of cargo space with all seats in place, and 68.3 cubic feet with the rear seats folded. When you have a 6.2-liter supercharged V8 in a reasonably large SUV, you can't expect fuel economy numbers to be very good. The Grand Cherokee Trackhawk's fuel economy is pretty terrible, but if you're spending this close to six figures on a high-powered SUV, you probably don't care too much about that. Driving Factors: We drove quite a lot on the highway. On the highway the highest we saw was about 16 mpg. Around town, we saw about 9 mpg. We tired not to be heavy with the throttle too often, but it's hard in this partucular vehicle. The base audio system for the Trackhawk is the 9-speaker audio system. 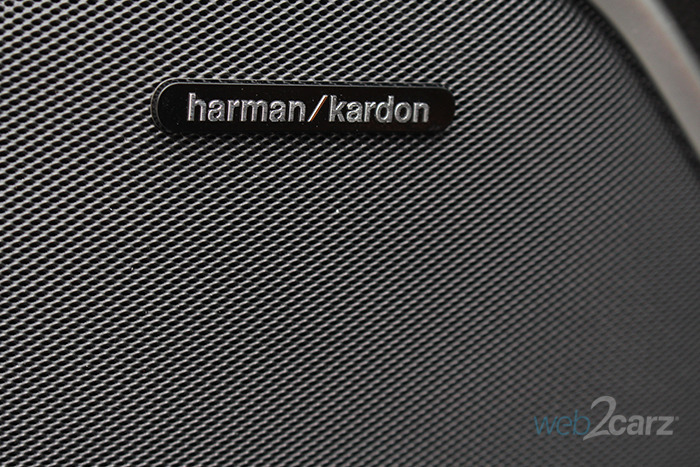 Our tester came with the $1,995 optional Harman Kardon system that comes with 19 speakers and a subwoofer. It provides excellent sound to all areas of the cabin and is well worth the expensive price tag. Final Thoughts The Jeep Grand Cherokee is a vehicle that doesn't seem to make much sense on paper. It's only after you get behind the wheel and drive it that you understand it. It's a monster of an SUV that happens to also be pretty practical and easy to live with. We have few complaints about the model other than its abysmal fuel economy, and we tried our best to be judicious with the throttle. If you don't mind paying a lot in fuel costs, and want a high-powered, adrenaline-producing vehicle, we can thing of few that are as good of a buy as the Grand Cherokee Trackhawk.